Antonella Preti, graduated with a degree in Biology specializing in Marine Ecology from the University of Turin, Italy. She is currently attending a long distance Ph.D. program through the School of Biological Sciences of Aberdeen, Scotland. 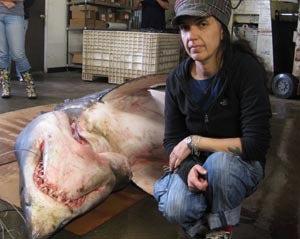 She has been working for 15 years on the feeding ecology of large pelagic species (sharks, swordfish and cetaceans) caught in the California drift gill net fisheries at the Southwest Fisheries Science Center in La Jolla, California. She has co-authored numerous scientific publications and two books, Mako Sharks and Sharks of the Pacific Northwest. When most people refer to a “once in a lifetime fish” they generally mean a big fish that they fought for a long time that will make an excellent trophy for their mantle or a story for their grandchildren. When marine scientists talk about a “once in a lifetime fish,” we often mean a species that is so rarely seen that we feel lucky to have observed it, even after it has washed up on a beach somewhere. This month we in Southern California have been lucky enough to have one such “once in a lifetime fish” appear twice in a span of a week, as two oarfish washed ashore local beaches. The first, an 18-foot specimen was found on Catalina Island and the second, a 14-foot specimen (approximately 275 pounds), was found in Oceanside, CA. I had the unique opportunity to assist in the necropsy of the second individual at Southwest Fisheries Science Center (SWFSC) in La Jolla, CA. This was an interesting and exciting opportunity to learn more about a species about which little is known as it rarely encountered. The easiest way to tell that this was an exciting scientific discovery was by the spectators in the necropsy lab. As fish dissections can be a little messy and smelly, people who are not actively working on a necropsy project normally avoid this lab, but on this particular morning the lab was standing room only. As I put on my lab coat, I had to weave through a crowd of excited scientists with cameras and iphones, who looked like teenagers waiting outside Justin Bieber’s dressing room. Along with my giddy colleagues, were a bevy of local media outlets interested in sharing our findings with the public (which is an important part of our job). The last time an oarfish washed up in this area was 1996 (a 23-footer), so this really was a unique experience. The purpose of the necropsy was twofold. The first was to see if we could determine a cause of death and the second was to collect as many biological samples as possible, so that we and our collaborators can learn as much about the species as we are able. The first thing I noticed about the oarfish is that it was mostly composed of a soft, white muscle and lacked observable scales. It also has a pronounced dorsal fin that runs the length of its body, which it uses to swim through the water column. Another really interesting find was that the oarfish had several cookie cutter wounds on its body, which is actually common for mesopelagic fish. Cookie cutters are small sharks with mouths similar to melon scoops and they leave identifiable circular wounds on their prey. As soon as we cut the fish open it was clear that she was a female, as eggs started to ooze out of her ovaries, thousands of them. According to the reference catalog on FishBase, oarfish spawn between July and December, and the presence of these eggs in a fish in October supports that idea. It also seems like the eggs may have been in different development stages, which may indicate that oarfish may have multiple spawning events per year. Another interesting thing that I noticed was that the head of the oarfish seemed to be cartilaginous as opposed to having a fully calcified, bony skull. I work primarily on feeding ecology of pelagic marine predators, so I was excited to look at the stomach contents of this fish. The literature suggests that they may feed on euphausiids (shrimp-like crustaceans commonly known as krill) and possibly salps (a jelly like, pelagic tunicate). I was able to conduct a quick, preliminary stomach contents analysis during the dissection. To do this I dissect the stomach and sift its contents through a series of sieves and identify all the food items that appear. The stomach of this particular fish was almost empty, but there were a few euphausiids, supporting previous findings. Despite having few prey items, the stomach was filled with parasites, which were collected for further analysis and identification. We also saved various tissue samples for future stable isotope analysis, which will further allow us to determine the trophic ecology of this elusive fish. Of course, a fish this rare will not go to waste. We collected many other biological samples to share with colleagues around the globe to study the physiology, morphology and ecology of this species. The head was shared with collaborators at Scripps Institution of Oceanography, where it will be a part of their world renowned fish collection. The eye of this species, which is specially adapted for low-light, deep water environment was sent to the EyeCare for Animals Center. 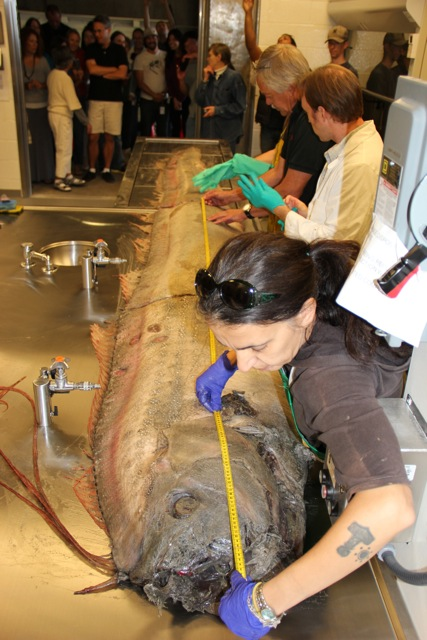 The entire body was shared with a colleague at Cal State Fullerton to study the biomechanics of oarfish swimming. The gills were collected to be studied by Nick Wegner, a functional morphologist at SWFSC, who specializes in the comparative physiology of fish respiratory systems. 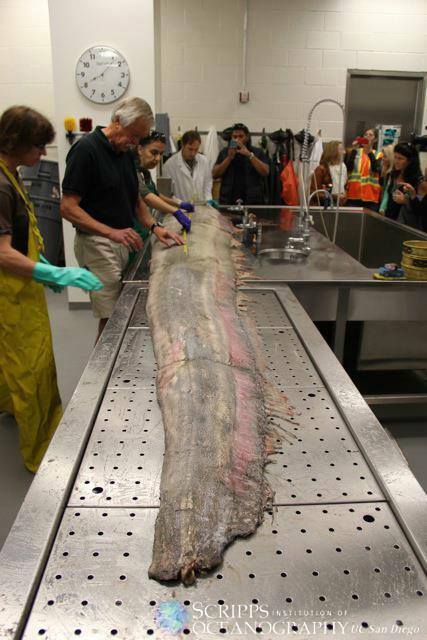 The heart of the oarfish was sent to a colleague at the UCSD medical school. Liver and muscle tissue were collected for the afore mentioned staple isotope analyses, but also will be used for fatty acid analyses as well as for contaminant analyses, which will tell us to what anthropogenic pollutants this fish was exposed (such as mercury or persistent organic pollutants). The bile salts will be analyzed by a Professor at UCSD. Some tissue will even be used to look at radioactivity exposure similar to how a recent study showed how tuna species in the Northeastern Pacific showed signatures Fukushima disaster (Madigan et al. 2013). We also collected muscle biopsies for genetic analyses. These will be used for evolutionary, ecological, and kinship studies. 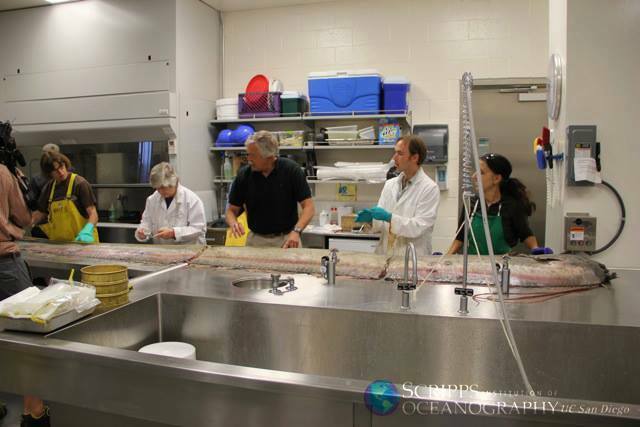 Lastly, a group of researchers tried to find the fish’s otoliths. Otolits are an inner ear bone found in fish that are useful for studying various life history traits. Much like tree trunks, otoliths develop rings as the organism grows, which can be used for determining the animal’s age. Microchemistry of the otoliths can also help determine where a fish was located at different life stages. Unfortunately, looking for otoliths in an oarfish is like looking for a needle in a haystack as they are very small and are buried inside a large cavity in the fish’s head. Since the otoliths were not found, this fish’s age will remain a secret. Dissecting this oarfish was really a great experience. It gave me the opportunity to see a rare species, that most people will never encounter. It also, is a great example of how scientists can work collaboratively to make the most of an opportunistic sample. I look forward to the coming weeks and months, during which all these samples will be studied and we will learn so much about this elusive species. Being a part of this project was really a once in a lifetime experience.